After installationg Windows Server 2008 Core (of any editions i.e. Enterprise or Standard) in a virtual machine using Virtual PC 2007 SP1 (VPC 2007 SP1), which has the option to setup Windows Server 2008 in the VM creation wizard, it’s not possible or cannot install Virtual Machine Additions into the Windows Server 2008 Core. When attempting to install the VM Additions (VM Additions can be installed by running setup.exe in \Windows folder after choosing the VM Additions command of Virtual PC), the installation will fail and rollback. 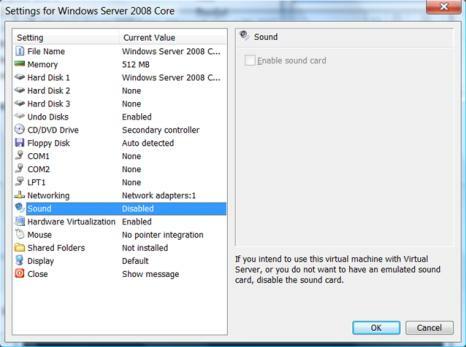 To fix and solve the VM Additions installation issue in Windows Server 2008 Core, try the disable sound card workaround. The solution is to disable the sound card in the virtual machine settings, as illustrated in figure below. After disabling and turning off the sound card availability in Windows Server 2008 Core VM, the installation of VM Additions will be completed successfully.